Vitamin D is a group of fat-soluble secosteroids responsible for increasing intestinal absorption of calcium, magnesium, and phosphate, and multiple other biological effects. In humans, the most important compounds in this group are vitamin D3 (also known as cholecalciferol) and vitamin D2 (ergocalciferol). Cholecalciferol and ergocalciferol can be ingested from the diet and from supplements. Only a few foods contain vitamin D. The major natural source of the vitamin is synthesis of cholecalciferol in the skin from cholesterol through a chemical reaction that is dependent on sun exposure (specifically UVB radiation). Dietary recommendations typically assume that all of a person's vitamin D is taken by mouth, as sun exposure in the population is variable and recommendations about the amount of sun exposure that is safe are uncertain in view of the skin cancer risk. Vitamin D from the diet, or from skin synthesis, is biologically inactive. A protein enzyme must hydroxylate it to convert it to the active form. This is done in the liver and in the kidneys. As vitamin D can be synthesized in adequate amounts by most mammals exposed to sufficient sunlight, it is not an essential dietary factor, and so not technically a vitamin. Instead it could be considered a hormone, with activation of the vitamin D pro-hormone resulting in the active form, calcitriol, which then produces effects via a nuclear receptor in multiple locations. Cholecalciferol is converted in the liver to calcifediol (25-hydroxycholecalciferol); ergocalciferol is converted to 25-hydroxyergocalciferol. These two vitamin D metabolites (called 25-hydroxyvitamin D or 25(OH)D) are measured in serum to determine a person's vitamin D status. Calcifediol is further hydroxylated by the kidneys to form calcitriol (also known as 1,25-dihydroxycholecalciferol), the biologically active form of vitamin D. Calcitriol circulates as a hormone in the blood, having a major role regulating the concentration of calcium and phosphate, and promoting the healthy growth and remodeling of bone. Calcitriol also has other effects, including some on cell growth, neuromuscular and immune functions, and reduction of inflammation. Vitamin D has a significant role in calcium homeostasis and metabolism. Its discovery was due to effort to find the dietary substance lacking in children with rickets (the childhood form of osteomalacia). Vitamin D supplements are given to treat or to prevent osteomalacia and rickets, but the evidence for other health effects of vitamin D supplementation in the general population is inconsistent. The effect of vitamin D supplementation on mortality is not clear, with one meta-analysis finding a small decrease in mortality in elderly people, and another concluding no clear justification exists for recommending supplementation for preventing many diseases, and that further research of similar design is unneeded in these areas. Calcium regulation in the human body. 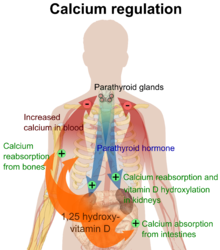 The role of active vitamin D (1,25-dihydroxyvitamin D, calcitriol) is shown in orange. The active vitamin D metabolite calcitriol mediates its biological effects by binding to the vitamin D receptor (VDR), which is principally located in the nuclei of target cells. The binding of calcitriol to the VDR allows the VDR to act as a transcription factor that modulates the gene expression of transport proteins (such as TRPV6 and calbindin), which are involved in calcium absorption in the intestine. The vitamin D receptor belongs to the nuclear receptor superfamily of steroid/thyroid hormone receptors, and VDRs are expressed by cells in most organs, including the brain, heart, skin, gonads, prostate, and breast. VDR activation in the intestine, bone, kidney, and parathyroid gland cells leads to the maintenance of calcium and phosphorus levels in the blood (with the assistance of parathyroid hormone and calcitonin) and to the maintenance of bone content. The VDR regulates cell proliferation and differentiation. Vitamin D also affects the immune system, and VDRs are expressed in several white blood cells, including monocytes and activated T and B cells. In vitro, vitamin D increases expression of the tyrosine hydroxylase gene in adrenal medullary cells, and affects the synthesis of neurotrophic factors, nitric oxide synthase, and glutathione. A diet deficient in vitamin D in conjunction with inadequate sun exposure causes osteomalacia (or rickets when it occurs in children), which is a softening of the bones. In the developed world, this is a rare disease. However, vitamin D deficiency has become a worldwide problem in the elderly and remains common in children and adults. Low blood calcifediol (25-hydroxy-vitamin D) can result from avoiding the sun. Deficiency results in impaired bone mineralization and bone damage which leads to bone-softening diseases, including rickets and osteomalacia. Being deficient in vitamin D can cause intestinal absorption of dietary calcium to fall to 15%. When not deficient, an individual usually absorbs between 60-80%. Rickets, a childhood disease, is characterized by impeded growth and soft, weak, deformed long bones that bend and bow under their weight as children start to walk. This condition is characterized by bow legs, which can be caused by calcium or phosphorus deficiency, as well as a lack of vitamin D; today, it is largely found in low-income countries in Africa, Asia, or the Middle East and in those with genetic disorders such as pseudovitamin D deficiency rickets. Maternal vitamin D deficiency may cause overt bone disease from before birth and impairment of bone quality after birth. Nutritional rickets exists in countries with intense year-round sunlight such as Nigeria and can occur without vitamin D deficiency. Although rickets and osteomalacia are now rare in the UK, outbreaks have happened in some immigrant communities in which osteomalacia sufferers included women with seemingly adequate daylight outdoor exposure wearing Western clothing. Having darker skin and reduced exposure to sunshine did not produce rickets unless the diet deviated from a Western omnivore pattern characterized by high intakes of meat, fish, and eggs, and low intakes of high-extraction cereals. The dietary risk factors for rickets include abstaining from animal foods. Vitamin D deficiency remains the main cause of rickets among young infants in most countries, because breast milk is low in vitamin D and social customs and climatic conditions can prevent adequate sun exposure. In sunny countries such as Nigeria, South Africa, and Bangladesh, where rickets occurs among older toddlers and children, it has been attributed to low dietary calcium intakes, which are characteristic of cereal-based diets with limited access to dairy products. Rickets was formerly a major public health problem among the US population; in Denver, where ultraviolet rays are about 20% stronger than at sea level on the same latitude, almost two-thirds of 500 children had mild rickets in the late 1920s. An increase in the proportion of animal protein in the 20th century American diet coupled with increased consumption of milk fortified with relatively small quantities of vitamin D coincided with a dramatic decline in the number of rickets cases. Also, in the United States and Canada, vitamin D-fortified milk, infant vitamin supplements, and vitamin supplements have helped to eradicate the majority of cases of rickets for children with fat malabsorption conditions. Dark-skinned people living in temperate climates have been shown to have low vitamin D levels but the significance of this is not certain. Dark-skinned people may be less efficient at making vitamin D because melanin in the skin hinders vitamin D synthesis. The effects of vitamin D supplementation on health are uncertain. A 2013 review did not find any effect from supplementation on the rates of disease, other than a tentative decrease in mortality in the elderly. Vitamin D supplements do not alter the outcomes for myocardial infarction, stroke or cerebrovascular disease, cancer, bone fractures or knee osteoarthritis. Low vitamin D levels may result from disease rather than cause disease. In general, no good evidence supports the commonly held belief that vitamin D supplements can help prevent osteoporosis. Its general use for prevention of this disease in those without vitamin D deficiency is thus likely not needed. For older people with osteoporosis, taking vitamin D with calcium may help prevent hip fractures, but it also slightly increases the risk of stomach and kidney problems. Supplementation with higher doses of vitamin D, in those older than 65 years, may decrease fracture risk. The effect is small or none for people living independently. Low serum vitamin D levels have been associated with falls, and low bone mineral density. Taking extra vitamin D, however, does not appear to change the risk. Athletes who are vitamin D deficient are at an increased risk of stress fractures and/or major breaks, particularly those engaging in contact sports. The greatest benefit with supplementation is seen in athletes who are deficient (25(OH)D serum levels <30 ng/mL), or severely deficient (25(OH)D serum levels <25 ng/mL). Incremental decreases in risks are observed with rising serum 25(OH)D concentrations plateauing at 50 ng/mL with no additional benefits seen in levels beyond this point. Because it found mounting evidence for a benefit to bone health, though it had not found good evidence of other benefits, the US Food and Drug Administration has required manufacturers to declare the amount of vitamin D on nutrition facts labels, as "nutrients of public health significance", since May 2016. By a proposed deadline extension, small manufacturers with less than $10 million in annual food sales will have to comply by 1 Jan 2021, while larger ones have to comply by 1 Jan 2020. Vitamin D supplements have been widely marketed for their claimed anticancer properties. Associations have been shown in observational studies between low vitamin D levels and the risk of development of certain cancers. It is unclear, however, if taking additional vitamin D in the diet or as supplements affects the risk of cancer. Reviews have described the evidence as being "inconsistent, inconclusive as to causality, and insufficient to inform nutritional requirements" and "not sufficiently robust to draw conclusions". One 2014 review found that supplements had no significant effect on cancer risk. Another 2014 review concluded that vitamin D3 may decrease the risk of death from cancer (one fewer death in 150 people treated over 5 years), but concerns with the quality of the data were noted. Insufficient evidence exists to recommend vitamin D supplements for people with cancer, although some evidence suggests that low vitamin D may be associated with a worse outcome for some cancers, and that higher 25-hydroxy vitamin D levels at the time of diagnosis are associated with better outcomes. Taking vitamin D supplements does not meaningfully reduce the risk of stroke, cerebrovascular disease, cardial infarction, or ischaemic heart disease. Supplementation may have no effect on blood pressure. In general, vitamin D functions to activate the innate and dampen the adaptive immune systems. Deficiency has been linked to increased risk or severity of viral infections, including HIV. Low levels of vitamin D appear to be a risk factor for tuberculosis, and historically it was used as a treatment. Supplementation slightly decreases the risk of acute respiratory tract infections and the exacerbation of asthma. Evidence is lacking on whether it does so in children under five years of age. No clinical trials have been done to assess its effect on preventing other infections, such as malaria. Although tentative data link low levels of vitamin D to asthma, evidence to support a beneficial effect on asthmatics from supplementation is inconclusive. Accordingly, supplementation is not currently recommended for treatment or prevention of asthma. Vitamin D and multiple sclerosis incidence have been linked, but it is not clear what the nature of any causal relationship might be. Two systemic reviews concluded that the evidence for vitamin D supplementation being helpful for treating people with multiple sclerosis is inconclusive. Low levels of vitamin D are associated with two major forms of human Inflammatory bowel disease (IBD): Crohn's disease and ulcerative colitis. However, further studies are required to determine its significance and the potential role of vitamin D axis in IBD. Diabetes -- A systematic review of 2014 concluded that the available studies show no evidence of vitamin D3 supplementation having an effect on glucose homeostasis or diabetes prevention. A review article of 2016 reported that while there is increasing evidence that vitamin D deficiency may be a risk factor for diabetes, over-all evidence regarding vitamin D levels and diabetes mellitus is contradictory, requiring further studies. Cognition and dementia -- A systematic review of clinical studies found an association between low vitamin D levels with cognitive impairment and a higher risk of developing Alzheimer's disease. However, lower vitamin D concentrations are also associated with poor nutrition and spending less time outdoors. Therefore, alternative explanations for the increase in cognitive impairment exist and hence a direct causal relationship between vitamin D levels and cognition could not be established. Pregnancy -- Low levels of vitamin D in pregnancy are associated with gestational diabetes, pre-eclampsia, and small (for gestational age) infants. Although taking vitamin D supplements during pregnancy raises blood levels of vitamin D in the mother at term, the extent of benefits for the mother or baby is unclear. Pregnant women who take an adequate amount of vitamin D during gestation may experience a lower risk of pre-eclampsia and positive immune effects. A 2018 review found that supplements may reduce the risk of undersized babies and of their poor rate of growth. Pregnant women often do not take the recommended amount of vitamin D.
Weight loss -- Though hypothesized that vitamin D supplementation may be an effective treatment for obesity apart from calorie restriction, one systematic review found no association of supplementation with body weight or fat mass. A 2016 meta-analysis found that circulating vitamin D status was improved by weight loss, indicating that fat mass may be inversely associated with blood levels of vitamin D.
"Adequate calcium and vitamin D, as part of a well balanced diet, along with physical activity, may reduce the risk of osteoporosis." Conversion: 1 µg = 40 IU. Various institutions have proposed different recommendations for the amount of daily intake of vitamin D. These vary according to precise definition, age, pregnancy or lactation, and the extent assumptions are made regarding skin synthesis of vitamin D.
For U.S food and dietary supplement labeling purposes, the amount in a serving is expressed as a percent of Daily Value (%DV). For vitamin D labeling purposes, 100% of the Daily Value was 400 IU (10 μg), but on May 27, 2016 it was revised to 800 IU (20 μg) to bring it into agreement with the RDA. The deadline to be in compliance was extended to January 1, 2020 for large companies and January 1, 2021 for small companies. Health Canada published recommended dietary allowances (RDA) and tolerable upper intake levels for vitamin D in 2012 based on the Institute of Medicine report. Australia and New Zealand published nutrient reference values including guidelines for dietary vitamin D intake in 2005. About a third of Australians have vitamin D deficiency. The European Food Safety Authority (EFSA) in 2016 reviewed the current evidence, finding the relationship between serum 25(OH)D concentration and musculoskeletal health outcomes is widely variable. They considered that average requirements and population reference intakes values for vitamin D cannot be derived, and that a serum 25(OH)D concentration of 50 nmol/L was a suitable target value. For all people over the age of 1, including women who are pregnant or lactating, they set an adequate intake of 15 μg/day (600 IU). The EFSA reviewed safe levels of intake in 2012, setting the tolerable upper limit for adults at 100 μg/day (4000 IU), a similar conclusion as the IOM. The Swedish Food Administration recommends a daily intake of 10 μg (400 IU) of vitamin D3 for children and adults up to 75 years, and 20 μg (800 IU) for adults 75 and older. Non-government organisations in Europe have made their own recommendations. The German Society for Nutrition recommends 20 µg. The European Menopause and Andropause Society recommends postmenopausal women consume15 µg (600 IU) until age 70, and 20 µg (800 IU) from age 71. This dose should be increased to 100 µg (4,000 IU) in some patients with very low vitamin D status or in case of co-morbid conditions. Although vitamin D is not present naturally in most foods, it is commonly added as a fortification in manufactured foods. In some countries, staple foods are artificially fortified with vitamin D.
In general, vitamin D2 is found in fungi and vitamin D3 is found in animals. Vitamin D2 is produced by ultraviolet irradiation of ergosterol found in many fungi. The vitamin D2 content in mushrooms and Cladina arbuscula, a lichen, increase with exposure to ultraviolet light. This process is emulated by industrial ultraviolet lamps, concentrating vitamin D2 levels to higher levels. The United States Department of Agriculture reports D2 and D3 content combined in one value. C. arbuscula (lichen), thalli, dry: vitamin D3 0.67 to 2.04 μg/g (27 to 82 IU/g); vitamin D2 0.22-0.55 μg/g (8.8 to 22 IU/g). Manufactured foods fortified with Vitamin D include some fruit juices and fruit juice drinks, meal replacement energy bars, soy protein-based beverages, certain cheese and cheese products, flour products, infant formulas, many breakfast cereals, and milk. In 2016 in the United States, the Food and Drug Administration (FDA) amended food additive regulations for milk fortification, stating that vitamin D3 levels not exceed 42 IU vitamin D per 100 g (400 IU per US quart) of dairy milk, 84 IU of vitamin D2 per 100 g (800 IU per quart) of plant milks, and 89 IU per 100 g (800 IU per quart) in plant-based yogurts. Plant milks are defined as beverages made from soy, almond, rice, among other plant sources intended as alternatives to dairy milk. Vitamin D content in typical foods is reduced variably by cooking. Boiled, fried and baked foods retained 69–89% of original vitamin D.
Recommendations on recommended 25(OH)D serum levels vary across authorities, and vary based on factors like age. US labs generally report 25(OH)D levels in ng/mL. 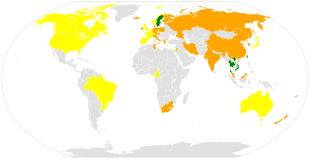 Other countries often use nmol/L. One ng/mL is approximately equal to 2.5 nmol/L. A 2014 review concluded that the most advantageous serum levels for 25(OH)D for all outcomes appeared to be close to 30 ng/mL (75 nmol/L). The optimal vitamin D levels are still controversial and another review concluded that ranges from 30 to 40 ng/mL (75 to 100 nmol/L) were to be recommended for athletes. Part of the controversy is because numerous studies have found differences in serum levels of 25(OH)D between ethnic groups; studies point to genetic as well as environmental reasons behind these variations. Supplementation to achieve these standard levels could cause harmful vascular calcification. A 2012 meta-analysis showed that the risk of cardiovascular diseases increases when blood levels of vitamin D are lowest in a range of 8 to 24 ng/mL (20 to 60 nmol/L), although results among the studies analyzed were inconsistent. In 2011 an IOM committee concluded a serum 25(OH)D level of 20 ng/mL (50 nmol/L) is needed for bone and overall health. The dietary reference intakes for vitamin D are chosen with a margin of safety and 'overshoot' the targeted serum value to ensure the specified levels of intake achieve the desired serum 25(OH)D levels in almost all persons. No contributions to serum 25(OH)D level are assumed from sun exposure and the recommendations are fully applicable to people with dark skin or negligible exposure to sunlight. The Institute found serum 25(OH)D concentrations above 30 ng/mL (75 nmol/L) are "not consistently associated with increased benefit". Serum 25(OH)D levels above 50 ng/mL (125 nmol/L) may be cause for concern. However, some people with serum 25(OH)D between 30 and 50 ng/mL (75 nmol/L-125 nmol/L) will also have inadequate vitamin D.
Pregnant or breastfeeding women should consult a doctor before taking a vitamin D supplement. The FDA advised manufacturers of liquid vitamin D supplements that droppers accompanying these products should be clearly and accurately marked for 400 international units (1 IU is the biological equivalent of 25 ng cholecalciferol/ergocalciferol). In addition, for products intended for infants, the FDA recommends the dropper hold no more than 400 IU. For infants (birth to 12 months), the tolerable upper limit (maximum amount that can be tolerated without harm) is set at 25 μg/day (1,000 IU). One thousand micrograms per day in infants has produced toxicity within one month. After being commissioned by the Canadian and American governments, the Institute of Medicine (IOM) as of 30 November 2010[update], has increased the tolerable upper limit (UL) to 2,500 IU per day for ages 1–3 years, 3,000 IU per day for ages 4–8 years and 4,000 IU per day for ages 9–71+ years (including pregnant or lactating women). Calcitriol itself is auto-regulated in a negative feedback cycle, and is also affected by parathyroid hormone, fibroblast growth factor 23, cytokines, calcium, and phosphate. The main symptoms of vitamin D overdose which are those of hypercalcemia including anorexia, nausea, and vomiting. These may be followed by polyuria, polydipsia, weakness, insomnia, nervousness, pruritus and ultimately renal failure. Furthermore, proteinuria, urinary casts, azotemia, and metastatic calcification (especially in the kidneys) may develop. Other symptoms of vitamin D toxicity include mental retardation in young children, abnormal bone growth and formation, diarrhea, irritability, weight loss, and severe depression. Synthesis of vitamin D in nature is dependent on the presence of UV radiation and subsequent activation in liver and in kidney. 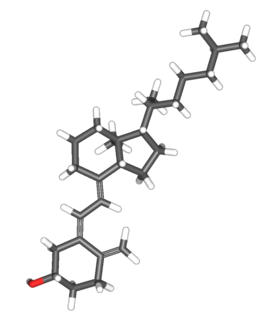 Many animals synthesize vitamin D3 from 7-dehydrocholesterol, and many fungi synthesize vitamin D2 from ergosterol. The transformation that converts 7-dehydrocholesterol to vitamin D3 occurs in two steps. First, 7-dehydrocholesterol is photolyzed by ultraviolet light in a 6-electron conrotatory ring-opening electrocyclic reaction; the product is previtamin D3. Second, previtamin D3 spontaneously isomerizes to vitamin D3 (cholecalciferol) in an antarafacial sigmatropic [1,7] hydride shift. At room temperature, the transformation of previtamin D3 to vitamin D3 in an organic solvent takes about 12 days to complete. The conversion of previtamin D3 to vitamin D3 in the skin is about 10 times faster than in an organic solvent. 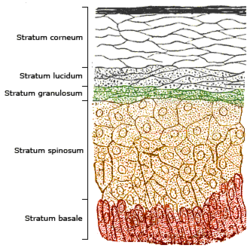 In the epidermal strata of the skin, vitamin D production is greatest in the stratum basale (colored red in the illustration) and stratum spinosum (colored light brown). Vitamin D3 is produced photochemically from 7-dehydrocholesterol in the skin of most vertebrate animals, including humans. The precursor of vitamin D3, 7-dehydrocholesterol is produced in relatively large quantities. 7-Dehydrocholesterol reacts with UVB light at wavelengths of 290–315 nm. These wavelengths are present in sunlight, as well as in the light emitted by the UV lamps in tanning beds (which produce ultraviolet primarily in the UVA spectrum, but typically produce 4% to 10% of the total UV emissions as UVB). Exposure to light through windows is insufficient because glass almost completely blocks UVB light. The skin consists of two primary layers: the inner layer called the dermis, composed largely of connective tissue, and the outer, thinner epidermis. Thick epidermis in the soles and palms consists of five strata; from outer to inner, they are: the stratum corneum, stratum lucidum, stratum granulosum, stratum spinosum, and stratum basale. Vitamin D is produced in the keratinocytes of two innermost strata, the stratum basale and stratum spinosum. Vitamin D can be synthesized only by a photochemical process. Phytoplankton in the ocean (such as coccolithophore and Emiliania huxleyi) have been photosynthesizing vitamin D for more than 500 million years. Primitive vertebrates in the ocean could absorb calcium from the ocean into their skeletons and eat plankton rich in vitamin D.
Land vertebrates required another source of vitamin D other than plants for their calcified skeletons. They had to either ingest it or be exposed to sunlight to photosynthesize it in their skin. Land vertebrates have been photosynthesizing vitamin D for more than 350 million years. In birds and fur-bearing mammals, fur or feathers block UV rays from reaching the skin. Instead, vitamin D is created from oily secretions of the skin deposited onto the feathers or fur, and is obtained orally during grooming. However, some animals, such as the naked mole-rat, are naturally cholecalciferol-deficient, as serum 25-OH vitamin D levels are undetectable. Vitamin D is carried in the bloodstream to the liver, where it is converted into the prohormone calcifediol. Circulating calcifediol may then be converted into calcitriol, the biologically active form of vitamin D, in the kidneys. Whether it is made in the skin or ingested, Vitamin D is hydroxylated in the liver at position 25 (upper right of the molecule) to form 25-hydroxycholecalciferol (calcifediol or 25(OH)D). This reaction is catalyzed by the microsomal enzyme vitamin D 25-hydroxylase, the product of the CYP2R1 human gene, and expressed by hepatocytes. Once made, the product is released into the plasma, where it is bound to an α-globulin carrier protein named the vitamin D-binding protein. Calcifediol is transported to the proximal tubules of the kidneys, where it is hydroxylated at the 1-α position (lower right of the molecule) to form calcitriol (1,25-dihydroxycholecalciferol, 1,25(OH)2D). The conversion of calcifediol to calcitriol is catalyzed by the enzyme 25-hydroxyvitamin D3 1-alpha-hydroxylase, which is the product of the CYP27B1 human gene. The activity of CYP27B1 is increased by parathyroid hormone, and also by low calcium or phosphate. Following the final converting step in the kidney, calcitriol is released into the circulation. By binding to vitamin D-binding protein, calcitriol is transported throughout the body, including to the classical target organs of intestine, kidney and bone. Calcitriol is the most potent natural ligand of the vitamin D receptor, which mediates most of the physiological actions of vitamin D.
In addition to the kidneys, calcitriol is also synthesized by certain other cells including monocyte-macrophages in the immune system. When synthesized by monocyte-macrophages, calcitriol acts locally as a cytokine, modulating body defenses against microbial invaders by stimulating the innate immune system. The activity of calcifediol and calcitriol can be reduced by hydroxylation at position 24 by vitamin D3 24-hydroxylase, forming secalciferol and calcitetrol, respectively. Metabolites produced from Vitamin D2 tend to bind less well to the vitamin D-binding protein. Vitamin D3 can alternatively be hydroxylated to calcifediol by sterol 27-hydroxylase (CYP27A1), but Vitamin D2 cannot. Ergocalciferol can be directly hydroxylated at position 24. The inactivation also tends to have a more profound effect: while calcitriol's activity decreases to 60% of original after 24-hydroxylation,  ercalcitriol suffers a 10-fold decrease in activity on conversion to ercalcitetrol. In 1969, after studying nuclear fragments of intestinal cells, a specific binding protein for Vitamin D called the Vitamin D Receptor was identified by Mark Haussler and Tony Norman. In 1971–72, the further metabolism of vitamin D to active forms was discovered. In the liver, vitamin D was found to be converted to calcifediol. Calcifediol is then converted by the kidneys to calcitriol, the biologically active form of vitamin D. Calcitriol circulates as a hormone in the blood, regulating the concentration of calcium and phosphate in the bloodstream and promoting the healthy growth and remodeling of bone. The vitamin D metabolites, calcifediol and calcitriol, were identified by competing teams led by Michael F. Holick in the laboratory of Hector DeLuca and by Tony Norman and colleagues. There is considerable research activity looking at effects of vitamin D and its metabolites in animal models, cell systems, gene expression studies, epidemiology and clinical therapeutics. These different types of studies can produce conflicting evidence as to the benefits of interventions with vitamin D. One school of thought contends the human physiology is fine-tuned to an intake of 4,000–12,000 IU/day from sun exposure with concomitant serum 25-hydroxyvitamin D levels of 40 to 80 ng/mL and this is required for optimal health. Proponents of this view, who include some members of the panel that drafted a now-superseded 1997 report on vitamin D from the IOM, contend the IOM's warning about serum concentrations above 50 ng/mL lacks biological plausibility. They suggest, for some people, reducing the risk of preventable disease requires a higher level of vitamin D than that recommended by the IOM. The United States National Institutes of Health Office of Dietary Supplements established a Vitamin D Initiative in 2014 to track current research and provide education to consumers. In their 2016 review, they recognise that a growing body of research suggests that vitamin D might play some role in the prevention and treatment of types 1 and 2 diabetes, glucose intolerance, hypertension, multiple sclerosis, and other medical conditions. They state further: "however, most evidence for these roles comes from in vitro, animal, and epidemiological studies, not the randomized clinical trials considered to be more definitive. Until such trials are conducted, the implications of the available evidence for public health and patient care will be debated". Some preliminary studies link low vitamin D levels with disease later in life. Evidence as of 2013 is insufficient to determine whether vitamin D affects the risk of cancer. One meta-analysis found a decrease in mortality in elderly people. Another meta-analysis covering over 350,000 people concluded that vitamin D supplementation in unselected community-dwelling individuals does not reduce skeletal (total fracture) or non-skeletal outcomes (myocardial infarction, ischaemic heart disease, stroke, cerebrovascular disease, cancer) by more than 15%, and that further research trials with similar design are unlikely to change these conclusions. ^ a b c d e Holick MF (December 2004). "Sunlight and vitamin D for bone health and prevention of autoimmune diseases, cancers, and cardiovascular disease". The American Journal of Clinical Nutrition. 80 (6 Suppl): 1678S–88S. doi:10.1093/ajcn/80.6.1678S. PMID 15585788. ^ a b c d Holick MF (March 2006). "High prevalence of vitamin D inadequacy and implications for health". Mayo Clinic Proceedings. 81 (3): 353–73. doi:10.4065/81.3.353. PMID 16529140. ^ Calvo MS, Whiting SJ, Barton CN (February 2005). "Vitamin D intake: a global perspective of current status". The Journal of Nutrition. 135 (2): 310–6. doi:10.1093/jn/135.2.310. PMID 15671233. ^ a b c d e f Norman AW (August 2008). "From vitamin D to hormone D: fundamentals of the vitamin D endocrine system essential for good health". The American Journal of Clinical Nutrition. 88 (2): 491S–499S. doi:10.1093/ajcn/88.2.491S. PMID 18689389. ^ a b c d "Vitamin D". NIH Office of Dietary Supplements. February 11, 2016. Retrieved June 6, 2017. ^ Hollis BW (January 1996). "Assessment of vitamin D nutritional and hormonal status: what to measure and how to do it". Calcified Tissue International. 58 (1): 4–5. doi:10.1007/BF02509538. PMID 8825231. ^ a b Holick MF, Schnoes HK, DeLuca HF, Suda T, Cousins RJ (July 1971). "Isolation and identification of 1,25-dihydroxycholecalciferol. A metabolite of vitamin D active in intestine". Biochemistry. 10 (14): 2799–804. doi:10.1021/bi00790a023. PMID 4326883. ^ a b c d Wolf G (June 2004). "The discovery of vitamin D: the contribution of Adolf Windaus". The Journal of Nutrition. 134 (6): 1299–302. doi:10.1093/jn/134.6.1299. PMID 15173387. ^ Pittas AG, Chung M, Trikalinos T, Mitri J, Brendel M, Patel K, Lichtenstein AH, Lau J, Balk EM (March 2010). "Systematic review: Vitamin D and cardiometabolic outcomes". Annals of Internal Medicine. 152 (5): 307–14. doi:10.7326/0003-4819-152-5-201003020-00009. PMC 3211092. PMID 20194237. ^ a b Chung M, Balk EM, Brendel M, Ip S, Lau J, Lee J, Lichtenstein A, Patel K, Raman G, Tatsioni A, Terasawa T, Trikalinos TA (August 2009). "Vitamin D and calcium: a systematic review of health outcomes". Evidence Report/Technology Assessment (183): 1–420. PMC 4781105. PMID 20629479. ^ a b c d Bjelakovic G, Gluud LL, Nikolova D, Whitfield K, Wetterslev J, Simonetti RG, Bjelakovic M, Gluud C (January 2014). "Vitamin D supplementation for prevention of mortality in adults". The Cochrane Database of Systematic Reviews (Systematic review). 1 (1): CD007470. doi:10.1002/14651858.CD007470.pub3. PMID 24414552. ^ a b c d e f Bolland MJ, Grey A, Gamble GD, Reid IR (April 2014). "The effect of vitamin D supplementation on skeletal, vascular, or cancer outcomes: a trial sequential meta-analysis". The Lancet Diabetes & Endocrinology (Meta-analysis). 2 (4): 307–20. doi:10.1016/S2213-8587(13)70212-2. PMID 24703049. ^ a b c d "About Vitamin D". University of California, Riverside. November 2011. Retrieved January 24, 2015. ^ Boron WF, Boulpaep EL (March 29, 2016). Medical Physiology E-Book. Elsevier Health Sciences. ISBN 978-1-4557-3328-6. ^ Bouillon R, Van Cromphaut S, Carmeliet G (February 2003). "Intestinal calcium absorption: Molecular vitamin D mediated mechanisms". Journal of Cellular Biochemistry. 88 (2): 332–9. doi:10.1002/jcb.10360. PMID 12520535. ^ a b Bell TD, Demay MB, Burnett-Bowie SA (September 2010). "The biology and pathology of vitamin D control in bone". Journal of Cellular Biochemistry. 111 (1): 7–13. doi:10.1002/jcb.22661. PMC 4020510. PMID 20506379. ^ Watkins RR, Lemonovich TL, Salata RA (May 2015). "An update on the association of vitamin D deficiency with common infectious diseases". Canadian Journal of Physiology and Pharmacology. 93 (5): 363–8. doi:10.1139/cjpp-2014-0352. PMID 25741906. ^ Puchacz E, Stumpf WE, Stachowiak EK, Stachowiak MK (February 1996). "Vitamin D increases expression of the tyrosine hydroxylase gene in adrenal medullary cells". Brain Research. Molecular Brain Research. 36 (1): 193–6. doi:10.1016/0169-328X(95)00314-I. PMID 9011759. ^ "Rickets". National Health Service. March 8, 2012. Retrieved July 9, 2012. ^ Eriksen EF, Glerup H (2002). "Vitamin D deficiency and aging: implications for general health and osteoporosis". Biogerontology. 3 (1–2): 73–7. doi:10.1023/A:1015263514765. PMID 12014847. ^ a b c d e f Holick MF (July 2007). "Vitamin D deficiency". The New England Journal of Medicine. 357 (3): 266–81. doi:10.1056/NEJMra070553. PMID 17634462. ^ Schoenmakers I, Goldberg GR, Prentice A (June 2008). "Abundant sunshine and vitamin D deficiency". The British Journal of Nutrition. 99 (6): 1171–3. doi:10.1017/S0007114508898662. PMC 2758994. PMID 18234141. ^ Grant WB, Holick MF (June 2005). "Benefits and requirements of vitamin D for optimal health: a review". Alternative Medicine Review. 10 (2): 94–111. PMID 15989379. ^ a b c d Brown JE, Isaacs J, Krinke B, Lechtenberg E, Murtaugh M (June 28, 2013). Nutrition Through the Life Cycle. Cengage Learning. ISBN 978-1-285-82025-5. ^ Lerch C, Meissner T (October 2007). Lerch C (ed.). "Interventions for the prevention of nutritional rickets in term born children". The Cochrane Database of Systematic Reviews (4): CD006164. doi:10.1002/14651858.CD006164.pub2. PMID 17943890. ^ Zargar AH, Mithal A, Wani AI, Laway BA, Masoodi SR, Bashir MI, Ganie MA (June 2000). "Pseudovitamin D deficiency rickets--a report from the Indian subcontinent". Postgraduate Medical Journal. 76 (896): 369–72. doi:10.1136/pmj.76.896.369. PMC 1741602. PMID 10824056. ^ Elidrissy AT (September 2016). "The Return of Congenital Rickets, Are We Missing Occult Cases?". Calcified Tissue International (Review). 99 (3): 227–36. doi:10.1007/s00223-016-0146-2. PMID 27245342. ^ Paterson CR, Ayoub D (October 2015). "Congenital rickets due to vitamin D deficiency in the mothers". Clinical Nutrition (Review). 34 (5): 793–8. doi:10.1016/j.clnu.2014.12.006. PMID 25552383. ^ Oramasionwu GE, Thacher TD, Pam SD, Pettifor JM, Abrams SA (August 2008). "Adaptation of calcium absorption during treatment of nutritional rickets in Nigerian children". The British Journal of Nutrition. 100 (2): 387–92. doi:10.1017/S0007114507901233. PMID 18197991. ^ Fischer PR, Rahman A, Cimma JP, Kyaw-Myint TO, Kabir AR, Talukder K, Hassan N, Manaster BJ, Staab DB, Duxbury JM, Welch RM, Meisner CA, Haque S, Combs GF (October 1999). "Nutritional rickets without vitamin D deficiency in Bangladesh". Journal of Tropical Pediatrics. 45 (5): 291–3. doi:10.1093/tropej/45.5.291. PMID 10584471. ^ a b Dunnigan MG, Henderson JB (November 1997). "An epidemiological model of privational rickets and osteomalacia". The Proceedings of the Nutrition Society. 56 (3): 939–56. doi:10.1079/PNS19970100. PMID 9483661. ^ Robertson I, Ford JA, McIntosh WB, Dunnigan MG (January 1981). "The role of cereals in the aetiology of nutritional rickets: the lesson of the Irish National Nutrition Survey 1943-8". The British Journal of Nutrition. 45 (1): 17–22. doi:10.1079/BJN19810073. PMID 6970590. ^ Clements MR (1989). "The problem of rickets in UK Asians". Journal of Human Nutrition and Dietetics. 2 (2): 105–116. doi:10.1111/j.1365-277X.1989.tb00015.x. ^ a b Pettifor JM (December 2004). "Nutritional rickets: deficiency of vitamin D, calcium, or both?". The American Journal of Clinical Nutrition. 80 (6 Suppl): 1725S–9S. doi:10.1093/ajcn/80.6.1725S. PMID 15585795. ^ a b Dunnigan MG, Henderson JB, Hole DJ, Barbara Mawer E, Berry JL (December 2005). "Meat consumption reduces the risk of nutritional rickets and osteomalacia". The British Journal of Nutrition. 94 (6): 983–91. doi:10.1079/BJN20051558. PMID 16351777. ^ "US National Institutes Of Health, National Cancer Institute". Science.education.nih.gov. Archived from the original on June 8, 2010. Retrieved August 24, 2010. ^ Weick MT (November 1967). "A history of rickets in the United States". The American Journal of Clinical Nutrition. 20 (11): 1234–41. doi:10.1093/ajcn/20.11.1234. PMID 4862158. ^ Garrison RH, Somer E (1997). The Nutrition Desk Reference. McGraw-Hill. ISBN 978-0-87983-826-3. ^ Dupuis, E. Melanie (February 1, 2002). Nature's Perfect Food: How Milk Became America's Drink. NYU Press. ISBN 978-0-8147-1938-1. ^ Teegarden D, Lyle RM, Proulx WR, Johnston CC, Weaver CM (May 1999). "Previous milk consumption is associated with greater bone density in young women". The American Journal of Clinical Nutrition. 69 (5): 1014–7. doi:10.1093/ajcn/69.5.1014. PMID 10232644. ^ a b c Insel P, Ross D, Bernstein M, McMahon K (March 18, 2015). Discovering Nutrition. Jones & Bartlett Publishers. ISBN 978-1-284-06465-0. ^ Holick MF (2003). "Vitamin D: A millenium perspective". Journal of Cellular Biochemistry. 88 (2): 296–307. doi:10.1002/jcb.10338. PMID 12520530. ^ Straube S, Andrew Moore R, Derry S, McQuay HJ (2009). "Vitamin D and chronic pain". Pain. 141 (1–2): 10–13. doi:10.1016/j.pain.2008.11.010. PMID 19084336. ^ Gaikwad M, Vanlint S, Mittinity M, Moseley GL, Stocks N (2016). "Does vitamin D supplementation alleviate chronic nonspecific musculoskeletal pain? A systematic review and meta-analysis". Clinical Rheumatology. 36 (5): 1201–1208. doi:10.1007/s10067-016-3205-1. PMID 26861032. ^ Lowe NM, Bhojani I (2017). "Special considerations for vitamin D in the south Asian population in the UK". Therapeutic Advances in Musculoskeletal Disease. 9 (6): 137–144. doi:10.1177/1759720X17704430. PMC 5466148. PMID 28620422. ^ O'Connor MY, Thoreson CK, Ramsey NL, Ricks M, Sumner AE (2013). "The uncertain significance of low vitamin D levels in African descent populations: a review of the bone and cardiometabolic literature". Progress in Cardiovascular Diseases. 56 (3): 261–269. doi:10.1016/j.pcad.2013.10.015. PMC 3894250. PMID 24267433. ^ a b Freedman BI, Register TC (2012). "Effect of race and genetics on vitamin D metabolism, bone and vascular health". Nature Reviews Nephrology. 8 (8): 459–466. doi:10.1038/nrneph.2012.112. PMID 22688752. ^ Khalid AT, Moore CG, Hall C, Olabopo F, Rozario NL, Holick MF, Greenspan SL, Rajakumar K (2017). "Utility of sun-reactive skin typing and melanin index for discerning vitamin D deficiency". Pediatric Research. 82 (3): 444–451. doi:10.1038/pr.2017.114. PMC 5570640. PMID 28467404. ^ Theodoratou E, Tzoulaki I, Zgaga L, Ioannidis JP (April 2014). "Vitamin D and multiple health outcomes: umbrella review of systematic reviews and meta-analyses of observational studies and randomised trials". BMJ. 348: g2035. doi:10.1136/bmj.g2035. PMC 3972415. PMID 24690624. ^ a b c Autier P, Boniol M, Pizot C, Mullie P (January 2014). "Vitamin D status and ill health: a systematic review". The Lancet Diabetes & Endocrinology. 2 (1): 76–89. doi:10.1016/S2213-8587(13)70165-7. PMID 24622671. ^ Bolland MJ, Grey A, Gamble GD, Reid IR (April 2014). "The effect of vitamin D supplementation on skeletal, vascular, or cancer outcomes: a trial sequential meta-analysis". The Lancet Diabetes & Endocrinology. 2 (4): 307–20. doi:10.1016/S2213-8587(13)70212-2. PMID 24703049. ^ a b c d e f g h i j k l Ross AC, Taylor CL, Yaktine AL, Del Valle HB (2011). Dietary Reference Intakes for Calcium and Vitamin D. Washington, D.C: National Academies Press. ISBN 978-0-309-16394-1. ^ a b Maxmen A (July 2011). "Nutrition advice: the vitamin D-lemma". Nature. 475 (7354): 23–5. doi:10.1038/475023a. PMID 21734684. ^ Schöttker B, Jorde R, Peasey A, Thorand B, Jansen EH, Groot LD, Streppel M, Gardiner J, Ordóñez-Mena JM, Perna L, Wilsgaard T, Rathmann W, Feskens E, Kampman E, Siganos G, Njølstad I, Mathiesen EB, Kubínová R, Pająk A, Topor-Madry R, Tamosiunas A, Hughes M, Kee F, Bobak M, Trichopoulou A, Boffetta P, Brenner H (June 2014). "Vitamin D and mortality: meta-analysis of individual participant data from a large consortium of cohort studies from Europe and the United States". BMJ. 348 (jun17 16): g3656. doi:10.1136/bmj.g3656. PMC 4061380. PMID 24938302. ^ Tuohimaa P (March 2009). "Vitamin D and aging". The Journal of Steroid Biochemistry and Molecular Biology. 114 (1–2): 78–84. doi:10.1016/j.jsbmb.2008.12.020. PMID 19444937. ^ Tuohimaa P, Keisala T, Minasyan A, Cachat J, Kalueff A (December 2009). "Vitamin D, nervous system and aging". Psychoneuroendocrinology. 34 Suppl 1: S278–86. doi:10.1016/j.psyneuen.2009.07.003. PMID 19660871. ^ Manya H, Akasaka-Manya K, Endo T (July 2010). "Klotho protein deficiency and aging". Geriatrics & Gerontology International. 10 Suppl 1 (Suppl 1): S80–7. doi:10.1111/j.1447-0594.2010.00596.x. PMID 20590845. ^ Reid IR, Bolland MJ, Grey A (January 2014). "Effects of vitamin D supplements on bone mineral density: a systematic review and meta-analysis". Lancet. 383 (9912): 146–55. doi:10.1016/s0140-6736(13)61647-5. PMID 24119980. ^ Avenell A, Mak JC, O'Connell D (April 2014). "Vitamin D and vitamin D analogues for preventing fractures in post-menopausal women and older men". The Cochrane Database of Systematic Reviews. 4 (4): CD000227. doi:10.1002/14651858.CD000227.pub4. PMID 24729336. ^ Bischoff-Ferrari HA, Willett WC, Orav EJ, Oray EJ, Lips P, Meunier PJ, Lyons RA, Flicker L, Wark J, Jackson RD, Cauley JA, Meyer HE, Pfeifer M, Sanders KM, Stähelin HB, Theiler R, Dawson-Hughes B (July 2012). "A pooled analysis of vitamin D dose requirements for fracture prevention". The New England Journal of Medicine. 367 (1): 40–9. doi:10.1056/NEJMoa1109617. hdl:1871/48765. PMID 22762317. ^ a b Chung M, Lee J, Terasawa T, Lau J, Trikalinos TA (December 2011). "Vitamin D with or without calcium supplementation for prevention of cancer and fractures: an updated meta-analysis for the U.S. Preventive Services Task Force". Annals of Internal Medicine. 155 (12): 827–38. doi:10.7326/0003-4819-155-12-201112200-00005. PMID 22184690. ^ Zhao JG, Zeng XT, Wang J, Liu L (December 2017). "Association Between Calcium or Vitamin D Supplementation and Fracture Incidence in Community-Dwelling Older Adults: A Systematic Review and Meta-analysis". JAMA. 318 (24): 2466–2482. doi:10.1001/jama.2017.19344. PMC 5820727. PMID 29279934. ^ Bolland MJ, Grey A, Gamble GD, Reid IR (July 2014). "Vitamin D supplementation and falls: a trial sequential meta-analysis". The Lancet Diabetes & Endocrinology. 2 (7): 573–80. doi:10.1016/S2213-8587(14)70068-3. PMID 24768505. ^ Shuler FD, Wingate MK, Moore GH, Giangarra C (November 2012). "Sports health benefits of vitamin d". Sports Health. 4 (6): 496–501. doi:10.1177/1941738112461621. PMC 3497950. PMID 24179588. ^ Byers T (July 2010). "Anticancer vitamins du Jour--The ABCED's so far". American Journal of Epidemiology (Review). 172 (1): 1–3. doi:10.1093/aje/kwq112. PMC 2892535. PMID 20562190. ^ Feldman D, Krishnan AV, Swami S, Giovannucci E, Feldman BJ (May 2014). "The role of vitamin D in reducing cancer risk and progression". Nature Reviews. Cancer. 14 (5): 342–57. doi:10.1038/nrc3691. PMID 24705652. ^ Buttigliero C, Monagheddu C, Petroni P, Saini A, Dogliotti L, Ciccone G, Berruti A (2011). "Prognostic role of vitamin d status and efficacy of vitamin D supplementation in cancer patients: a systematic review". The Oncologist. 16 (9): 1215–27. doi:10.1634/theoncologist.2011-0098. PMC 3228169. PMID 21835895. ^ Li M, Chen P, Li J, Chu R, Xie D, Wang H (July 2014). "Review: the impacts of circulating 25-hydroxyvitamin D levels on cancer patient outcomes: a systematic review and meta-analysis". The Journal of Clinical Endocrinology and Metabolism. 99 (7): 2327–36. doi:10.1210/jc.2013-4320. PMID 24780061. ^ Beveridge LA, Struthers AD, Khan F, Jorde R, Scragg R, Macdonald HM, et al. (May 2015). "Effect of Vitamin D Supplementation on Blood Pressure: A Systematic Review and Meta-analysis Incorporating Individual Patient Data". JAMA Internal Medicine. 175 (5): 745–54. doi:10.1001/jamainternmed.2015.0237. PMC 5966296. PMID 25775274. ^ Hewison M (2011). Vitamin D and innate and adaptive immunity. Vitamins and Hormones. Vitamins & Hormones. 86. pp. 23–62. doi:10.1016/B978-0-12-386960-9.00002-2. ISBN 9780123869609. PMID 21419266. ^ Beard JA, Bearden A, Striker R (2011). "Vitamin D and the anti-viral state". Journal of Clinical Virology. 50 (3): 194–200. doi:10.1016/j.jcv.2010.12.006. PMC 3308600. PMID 21242105. ^ Spector SA (2011). "Vitamin D and HIV: letting the sun shine in". Topics in Antiviral Medicine. 19 (1): 6–10. PMC 6148856. PMID 21852710. ^ Nnoaham KE, Clarke A (2008). "Low serum vitamin D levels and tuberculosis: a systematic review and meta-analysis". International Journal of Epidemiology. 37 (1): 113–119. doi:10.1093/ije/dym247. PMID 18245055. ^ Luong KV, Nguyen LT (2011). "Impact of vitamin D in the treatment of tuberculosis". The American Journal of the Medical Sciences. 341 (6): 493–498. doi:10.1097/MAJ.0b013e3182070f47. PMID 21289501. ^ Bergman P, Lindh AU, Björkhem-Bergman L, Lindh JD (2013). "Vitamin D and Respiratory Tract Infections: A Systematic Review and Meta-Analysis of Randomized Controlled Trials". PLoS One. 8 (6): e65835. Bibcode:2013PLoSO...865835B. doi:10.1371/journal.pone.0065835. PMC 3686844. PMID 23840373. ^ Martineau AR, Jolliffe DA, Hooper RL, Greenberg L, Aloia JF, Bergman P, et al. (2017). "Vitamin D supplementation to prevent acute respiratory tract infections: systematic review and meta-analysis of individual participant data". BMJ. 356: i6583. doi:10.1136/bmj.i6583. PMC 5310969. PMID 28202713. ^ Autier P, Mullie P, Macacu A, Dragomir M, Boniol M, Coppens K, Pizot C, Boniol M (2017). "Effect of vitamin D supplementation on non-skeletal disorders: a systematic review of meta-analyses and randomised trials". The Lancet. Diabetes & Endocrinology. 5 (12): 986–1004. doi:10.1016/S2213-8587(17)30357-1. PMID 29102433. ^ Yakoob MY, Salam RA, Khan FR, Bhutta ZA (2016). "Vitamin D supplementation for preventing infections in children under five years of age". The Cochrane Database of Systematic Reviews. 11: CD008824. doi:10.1002/14651858.cd008824.pub2. PMC 5450876. PMID 27826955. ^ Hart PH (June 2012). "Vitamin D supplementation, moderate sun exposure, and control of immune diseases". Discovery Medicine. 13 (73): 397–404. PMID 22742645. ^ Paul G, Brehm JM, Alcorn JF, Holguín F, Aujla SJ, Celedón JC (2012). "Vitamin D and asthma". American Journal of Respiratory and Critical Care Medicine. 185 (2): 124–132. doi:10.1164/rccm.201108-1502CI. PMC 3297088. PMID 22016447. ^ Pakpoor J, Ramagopalan S (2014). "Evidence for an Association Between Vitamin D and Multiple Sclerosis". Emerging and Evolving Topics in Multiple Sclerosis Pathogenesis and Treatments. Current Topics in Behavioral Neurosciences. 26. pp. 105–115. 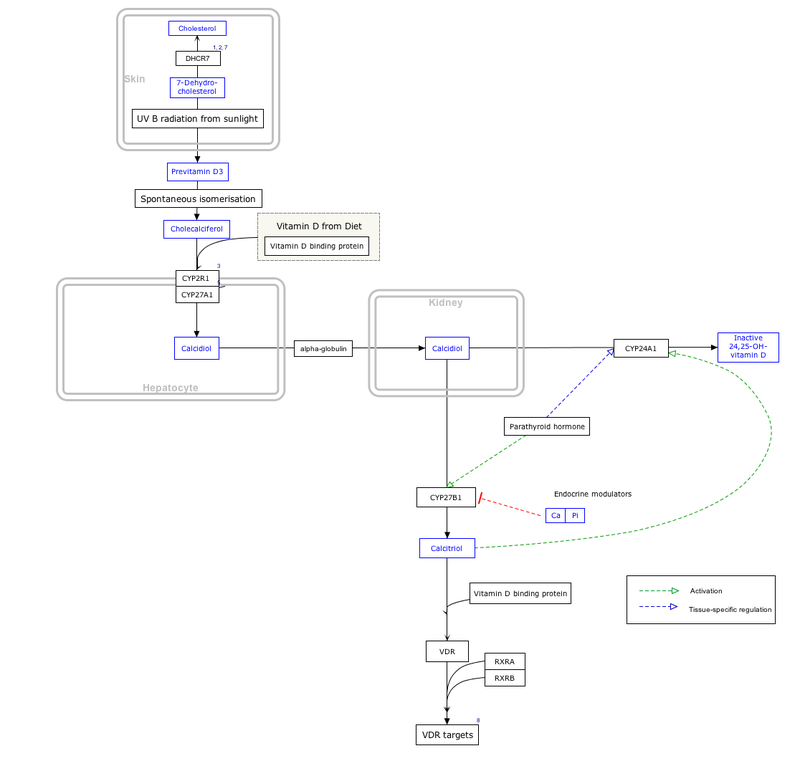 doi:10.1007/7854_2014_358. ISBN 978-3-319-25541-5. PMID 25502544. The evidence for vitamin D as a treatment for MS is inconclusive. ^ Pozuelo-Moyano B, Benito-León J, Mitchell AJ, Hernández-Gallego J (2013). "A systematic review of randomized, double-blind, placebo-controlled trials examining the clinical efficacy of vitamin D in multiple sclerosis". Neuroepidemiology (Systematic Review). 40 (3): 147–153. doi:10.1159/000345122. PMC 3649517. PMID 23257784. The available evidence substantiates neither clinically significant benefit nor harm from vitamin D in the treatment of patients with MS.
^ Thomas JS, Ellen MM (2018). "A review of vitamin D supplementation as disease-modifying therapy". Multiple Sclerosis Journal (Systematic Review). 24 (1): 6–11. doi:10.1177/1352458517738131. PMID 29307295. Several preliminary studies have reported results which have shown some promise, but none has yet provided significant evidence of a clinically meaningful improvement. ^ a b Del Pinto R, Pietropaoli D, Chandar AK, Ferri C, Cominelli F (November 2015). "Association Between Inflammatory Bowel Disease and Vitamin D Deficiency: A Systematic Review and Meta-analysis". Inflammatory Bowel Diseases. 21 (11): 2708–2717. doi:10.1097/MIB.0000000000000546. PMC 4615394. PMID 26348447. ^ Del Pinto R, Ferri C, Cominelli F (November 2017). "Vitamin D Axis in Inflammatory Bowel Diseases: Role, Current Uses and Future Perspectives". International Journal of Molecular Sciences. 18 (11): 2360. doi:10.3390/ijms18112360. PMC 5713329. PMID 29112157. ^ Seida JC, Mitri J, Colmers IN, Majumdar SR, Davidson MB, Edwards AL, Hanley DA, Pittas AG, Tjosvold L, Johnson JA (October 2014). "Clinical review: Effect of vitamin D3 supplementation on improving glucose homeostasis and preventing diabetes: a systematic review and meta-analysis". The Journal of Clinical Endocrinology and Metabolism (Review). 99 (10): 3551–60. doi:10.1210/jc.2014-2136. PMC 4483466. PMID 25062463. ^ Nakashima A, Yokoyama K, Yokoo T, Urashima M (March 2016). "Role of vitamin D in diabetes mellitus and chronic kidney disease". World Journal of Diabetes (Review). 7 (5): 89–100. doi:10.4239/wjd.v7.i5.89. PMC 4781904. PMID 26981182. ^ Shaffer JA, Edmondson D, Wasson LT, Falzon L, Homma K, Ezeokoli N, Li P, Davidson KW (April 2014). "Vitamin D supplementation for depressive symptoms: a systematic review and meta-analysis of randomized controlled trials". Psychosomatic Medicine. 76 (3): 190–6. doi:10.1097/psy.0000000000000044. PMC 4008710. PMID 24632894. ^ Balion C, Griffith LE, Strifler L, Henderson M, Patterson C, Heckman G, Llewellyn DJ, Raina P (September 2012). "Vitamin D, cognition, and dementia: a systematic review and meta-analysis". Neurology. 79 (13): 1397–405. doi:10.1212/WNL.0b013e31826c197f. PMC 3448747. PMID 23008220. ^ a b Aghajafari F, Nagulesapillai T, Ronksley PE, Tough SC, O'Beirne M, Rabi DM (March 2013). "Association between maternal serum 25-hydroxyvitamin D level and pregnancy and neonatal outcomes: systematic review and meta-analysis of observational studies". BMJ. 346: f1169. doi:10.1136/bmj.f1169. PMID 23533188. ^ a b c Palacios C, De-Regil LM, Lombardo LK, Peña-Rosas JP (November 2016). "Vitamin D supplementation during pregnancy: Updated meta-analysis on maternal outcomes". The Journal of Steroid Biochemistry and Molecular Biology. 164: 148–155. doi:10.1016/j.jsbmb.2016.02.008. PMC 5357731. PMID 26877200. ^ Roth DE, Leung M, Mesfin E, Qamar H, Watterworth J, Papp E (November 2017). "Vitamin D supplementation during pregnancy: state of the evidence from a systematic review of randomised trials". BMJ. 359: j5237. doi:10.1136/bmj.j5237. PMC 5706533. PMID 29187358. ^ a b Wagner CL, Taylor SN, Dawodu A, Johnson DD, Hollis BW (March 2012). "Vitamin D and its role during pregnancy in attaining optimal health of mother and fetus". Nutrients. 4 (3): 208–30. doi:10.3390/nu4030208. PMC 3347028. PMID 22666547. ^ Bi WG, Nuyt AM, Weiler H, Leduc L, Santamaria C, Wei SQ (May 2018). "Association Between Vitamin D Supplementation During Pregnancy and Offspring Growth, Morbidity, and Mortality: A Systematic Review and Meta-analysis". JAMA Pediatrics. 172 (7): 635–645. doi:10.1001/jamapediatrics.2018.0302. PMC 6137512. PMID 29813153. ^ Pathak K, Soares MJ, Calton EK, Zhao Y, Hallett J (June 2014). "Vitamin D supplementation and body weight status: a systematic review and meta-analysis of randomized controlled trials". Obesity Reviews. 15 (6): 528–37. doi:10.1111/obr.12162. PMID 24528624. ^ Mallard SR, Howe AS, Houghton LA (October 2016). "Vitamin D status and weight loss: a systematic review and meta-analysis of randomized and nonrandomized controlled weight-loss trials". The American Journal of Clinical Nutrition. 104 (4): 1151–1159. doi:10.3945/ajcn.116.136879. PMID 27604772. ^ a b c European Food Safety Authority (EFSA) Panel on Dietetic Products, Nutrition and Allergies (NDA) (2010). "Scientific opinion on the substantiation of health claims related to vitamin D and normal function of the immune system and inflammatory response (ID 154, 159), maintenance of normal muscle function (ID 155) and maintenance of normal cardiovascular function (ID 159) pursuant to Article 13(1) of Regulation (EC) No 1924/2006". EFSA Journal. 8 (2): 1468–85. doi:10.2903/j.efsa.2010.1468. ^ European Food Safety Authority (EFSA) Panel on Dietetic Products, Nutrition and Allergies (NDA) (2011). "Scientific opinion on the substantiation of a health claim related to vitamin D and risk of falling pursuant to Article 14 of Regulation (EC) No 1924/2006". EFSA Journal. 9 (9): 2382–2400. doi:10.2903/j.efsa.2011.2382. ^ "Guidance for Industry: A Food Labeling Guide (11. Appendix C: Health Claims) Food Labeling". US Food and Drug Administration. January 2013. ^ "Regulatory Systems of Health Claims in Japan" (PDF). Japan Consumer Affairs Agency, Food Labelling Division. June 1, 2011. Archived from the original (PDF) on March 6, 2012. Retrieved January 29, 2012. ^ "Vitamin D". Nutrient Reference Values for Australia and New Zealand. Australian Ministry of Health. September 9, 2005. Archived from the original on February 27, 2012. ^ a b c "Vitamin D and Calcium: Updated Dietary Reference Intakes". Nutrition and Healthy Eating. Health Canada. December 5, 2008. Retrieved April 28, 2018. ^ a b c "Nutrient reference values for Australia and New Zealand" (PDF). National Health and Medical Research Council. September 9, 2005. Retrieved April 28, 2018. ^ a b c d EFSA Panel on Dietetic Products, Nutrition and Allergies (NDA) (June 29, 2016). "Dietary reference values for vitamin D". EFSA Journal. 14 (10): e04547. doi:10.2903/j.efsa.2016.4547. ^ a b EFSA Panel on Dietetic Products, Nutrition and Allergies (NDA) (2012). "Scientific Opinion on the Tolerable Upper Intake Level of vitamin D". EFSA Journal (Submitted manuscript). 10 (7). doi:10.2903/j.efsa.2012.2813. ^ "Vitamins and minerals – Vitamin D". National Health Service. February 18, 2015. Retrieved July 21, 2016. ^ "PHE publishes new advice on vitamin D". Public Health England. July 21, 2016. Retrieved July 21, 2016. ^ "Vitamin D (translated)" (in Swedish). Swedish Food Administration. Retrieved October 19, 2018. ^ Pérez-López FR, Brincat M, Erel CT, Tremollieres F, Gambacciani M, Lambrinoudaki I, Moen MH, Schenck-Gustafsson K, Vujovic S, Rozenberg S, Rees M (January 2012). "EMAS position statement: Vitamin D and postmenopausal health". Maturitas. 71 (1): 83–8. doi:10.1016/j.maturitas.2011.11.002. PMID 22100145. ^ DRI, Dietary reference intakes: for calcium, phosphorus, magnesium, vitamin D, and fluoride. Washington, D.C: National Academy Press. 1997. p. 250. ISBN 978-0-309-06350-0. ^ a b c Holick MF (1992). "Evolutionary biology and pathology of vitamin D". J. Nutr. Sci. Vitaminol. Spec No: 79–83. doi:10.3177/jnsv.38.Special_79. PMID 1297827. ^ a b c d e Keegan RJ, Lu Z, Bogusz JM, Williams JE, Holick MF (January 2013). "Photobiology of vitamin D in mushrooms and its bioavailability in humans". Dermato-Endocrinology. 5 (1): 165–76. doi:10.4161/derm.23321. PMC 3897585. PMID 24494050. ^ a b Wang T, Bengtsson G, Kärnefelt I, Björn LO (September 2001). "Provitamins and vitamins D₂ and D₃ in Cladina spp. over a latitudinal gradient: possible correlation with UV levels". Journal of Photochemistry and Photobiology. B, Biology (Submitted manuscript). 62 (1–2): 118–22. doi:10.1016/S1011-1344(01)00160-9. PMID 11693362. ^ Haytowitz DB (2009). "Vitamin D in mushrooms" (PDF). Nutrient Data Laboratory, US Department of Agriculture. Retrieved April 16, 2018. ^ "Search, National Nutrient Database for Standard Reference Release 27". US Department of Agriculture, Agricultural Research Service. 2014. Retrieved June 12, 2015. ^ de Lourdes Samaniego-Vaesken M, Alonso-Aperte E, Varela-Moreiras G (2012). "Vitamin food fortification today". Food & Nutrition Research. 56: 5459. doi:10.3402/fnr.v56i0.5459. PMC 3319130. PMID 22481896. ^ a b Spiro A, Buttriss JL (December 2014). "Vitamin D: An overview of vitamin D status and intake in Europe". Nutrition Bulletin. 39 (4): 322–350. doi:10.1111/nbu.12108. PMC 4288313. PMID 25635171. ^ U.S. Department of Health and Human Services (July 15, 2016). "Food Additives & Ingredients - Vitamin D for Milk and Milk Alternatives". U.S. Food and Drug Administration. Retrieved February 22, 2017. ^ "Federal Register: Food Additives Permitted for Direct Addition to Food for Human Consumption; Vitamin D2". Food and Drug Administration, US Department of Health and Human Services. July 18, 2016. Retrieved February 22, 2017. ^ Tripkovic L (2013). "Vitamin D2 vs. vitamin D3: Are they one and the same?". Nutrition Bulletin. 38 (2): 243–248. doi:10.1111/nbu.12029. ^ Alshahrani F, Aljohani N (September 2013). "Vitamin D: deficiency, sufficiency and toxicity". Nutrients. 5 (9): 3605–16. doi:10.3390/nu5093605. PMC 3798924. PMID 24067388. Retrieved April 27, 2015. ^ Biancuzzo RM, Clarke N, Reitz RE, Travison TG, Holick MF (March 2013). "Serum concentrations of 1,25-dihydroxyvitamin D2 and 1,25-dihydroxyvitamin D3 in response to vitamin D2 and vitamin D3 supplementation". The Journal of Clinical Endocrinology and Metabolism. 98 (3): 973–9. doi:10.1210/jc.2012-2114. PMC 3590486. PMID 23386645. ^ Borel P, Caillaud D, Cano NJ (2015). "Vitamin D bioavailability: state of the art". Critical Reviews in Food Science and Nutrition. 55 (9): 1193–205. doi:10.1080/10408398.2012.688897. PMID 24915331. ^ Jakobsen J, Knuthsen P (April 2014). "Stability of vitamin D in foodstuffs during cooking". Food Chemistry. 148: 170–5. doi:10.1016/j.foodchem.2013.10.043. PMID 24262542. ^ Wahl DA, Cooper C, Ebeling PR, Eggersdorfer M, Hilger J, Hoffmann K, et al. (August 29, 2012). "A global representation of vitamin D status in healthy populations". Archives of Osteoporosis. 7 (1–2): 155–72. doi:10.1007/s11657-012-0093-0. PMID 23225293. ^ Wahl DA, Cooper C, Ebeling PR, Eggersdorfer M, Hilger J, Hoffmann K, Josse R, Kanis JA, Mithal A, Pierroz DD, Stenmark J, Stöcklin E, Dawson-Hughes B (February 1, 2013). "A global representation of vitamin D status in healthy populations: reply to comment by Saadi". Archives of Osteoporosis. 8 (1–2): 122. doi:10.1007/s11657-013-0122-7. PMID 23371520. ^ Bischoff-Ferrari HA (2014). Optimal serum 25-hydroxyvitamin D levels for multiple health outcomes. Advances in Experimental Medicine and Biology (Review). 810. pp. 500–25. doi:10.1007/978-0-387-77574-6_5. ISBN 978-0-387-77573-9. PMID 25207384. ^ a b Dahlquist DT, Dieter BP, Koehle MS (2015). "Plausible ergogenic effects of vitamin D on athletic performance and recovery". Journal of the International Society of Sports Nutrition (Review). 12: 33. doi:10.1186/s12970-015-0093-8. PMC 4539891. PMID 26288575. ^ Engelman CD, Fingerlin TE, Langefeld CD, Hicks PJ, Rich SS, Wagenknecht LE, Bowden DW, Norris JM (September 2008). "Genetic and environmental determinants of 25-hydroxyvitamin D and 1,25-dihydroxyvitamin D levels in Hispanic and African Americans". The Journal of Clinical Endocrinology and Metabolism. 93 (9): 3381–8. doi:10.1210/jc.2007-2702. PMC 2567851. PMID 18593774. ^ Wang L, Song Y, Manson JE, Pilz S, März W, Michaëlsson K, Lundqvist A, Jassal SK, Barrett-Connor E, Zhang C, Eaton CB, May HT, Anderson JL, Sesso HD (2012). "Circulating 25-hydroxy-vitamin D and risk of cardiovascular disease: a meta-analysis of prospective studies". Circulation: Cardiovascular Quality and Outcomes. 5 (6): 819–29. doi:10.1161/CIRCOUTCOMES.112.967604. PMC 3510675. PMID 23149428. ^ a b Ross AC, Manson JE, Abrams SA, Aloia JF, Brannon PM, Clinton SK, Durazo-Arvizu RA, Gallagher JC, Gallo RL, Jones G, Kovacs CS, Mayne ST, Rosen CJ, Shapses SA (January 2011). "The 2011 report on dietary reference intakes for calcium and vitamin D from the Institute of Medicine: what clinicians need to know". The Journal of Clinical Endocrinology and Metabolism. 96 (1): 53–8. doi:10.1210/jc.2010-2704. PMC 3046611. PMID 21118827. ^ a b c d Vieth R (May 1999). "Vitamin D supplementation, 25-hydroxyvitamin D concentrations, and safety" (PDF). The American Journal of Clinical Nutrition. 69 (5): 842–56. doi:10.1093/ajcn/69.5.842. PMID 10232622. ^ Tolerable Upper Intake Limits for Vitamins And Minerals (PDF). European Food Safety Authority. December 2006. ISBN 978-92-9199-014-6. ^ Olmos-Ortiz A, Avila E, Durand-Carbajal M, Díaz L (January 2015). "Regulation of calcitriol biosynthesis and activity: focus on gestational vitamin D deficiency and adverse pregnancy outcomes". Nutrients. 7 (1): 443–80. doi:10.3390/nu7010443. PMC 4303849. PMID 25584965. ^ Holick MF (April 1987). "Photosynthesis of vitamin D in the skin: effect of environmental and life-style variables". Federation Proceedings. 46 (5): 1876–82. PMID 3030826. ^ Deluca HF (January 2014). "History of the discovery of vitamin D and its active metabolites". BoneKEy Reports. 3: 479. doi:10.1038/bonekey.2013.213. PMC 3899558. PMID 24466410. ^ a b Holick MF (March 2004). "Vitamin D: importance in the prevention of cancers, type 1 diabetes, heart disease, and osteoporosis". The American Journal of Clinical Nutrition. 79 (3): 362–71. doi:10.1093/ajcn/79.3.362. PMID 14985208. ^ Eyley SC, Williams DH (1975). "Photolytic production of vitamin D. The preparative value of a photo-sensitiser". Journal of the Chemical Society, Chemical Communications (20): 858a. doi:10.1039/C3975000858A. ^ Keegan RJ, Lu Z, Bogusz JM, Williams JE, Holick MF (January 2013). "Photobiology of vitamin D in mushrooms and its bioavailability in humans". Dermato-Endocrinology. 5 (1): 165–76. doi:10.4161/derm.23321. PMC 3897585. PMID 24494050. ^ Crissey SD, Ange KD, Jacobsen KL, Slifka KA, Bowen PE, Stacewicz-Sapuntzakis M, Langman CB, Sadler W, Kahn S, Ward A (January 2003). "Serum concentrations of lipids, vitamin d metabolites, retinol, retinyl esters, tocopherols and selected carotenoids in twelve captive wild felid species at four zoos". The Journal of Nutrition. 133 (1): 160–6. doi:10.1093/jn/133.1.160. PMID 12514284. ^ Holick, Michael F. (2018). "Chapter 4: Photobiology of Vitamin D". In Feldman, David; Wesley Pike, J.; Bouillon, Roger; Giovannucci, Edward; Goltzman, David; Hewison, Martin (eds.). Vitamin D: Volume 1: Biochemistry, Physiology and Diagnostics (4th ed.). London, UK: Academic Press. ISBN 978-0-12-809965-0. ^ C. Claiborne Ray (May 17, 2005). "Sunshine Vitamin D". The New York Times. Archived from the original on February 21, 2013. Retrieved March 8, 2013. ^ Bolton J. "UV FAQs". International Ultraviolet Association. Archived from the original on May 30, 2013. ^ Holick MF (February 2002). "Vitamin D: the underappreciated D-lightful hormone that is important for skeletal and cellular health". Current Opinion in Endocrinology, Diabetes and Obesity. 9 (1): 87–98. doi:10.1097/00060793-200202000-00011. ^ Holick MF (September 2002). "Sunlight and vitamin D: both good for cardiovascular health". Journal of General Internal Medicine. 17 (9): 733–5. doi:10.1046/j.1525-1497.2002.20731.x. PMC 1495109. PMID 12220371. ^ a b Holick MF, Smith E, Pincus S (December 1987). "Skin as the site of vitamin D synthesis and target tissue for 1,25-dihydroxyvitamin D3. Use of calcitriol (1,25-dihydroxyvitamin D3) for treatment of psoriasis". Archives of Dermatology. 123 (12): 1677–1683a. doi:10.1001/archderm.1987.01660360108022. PMID 2825606. ^ Institute of Medicine (US) Committee to Review Dietary Reference Intakes for Vitamin D and Calcium (2011). "8, Implications and Special Concerns". In Ross AC, Taylor CL, Yaktine AL, Del Valle HB (eds.). Dietary Reference Intakes for Calcium and Vitamin D. The National Academies Collection: Reports funded by National Institutes of Health. Washington DC: National Academies Press. ISBN 978-0-309-16394-1. PMID 21796828. ^ "Anatomy of the skin". National Cancer Institute, US National Institutes of Health, Bethesda. 2016. Retrieved December 19, 2016. ^ "Vitamin D and Skin Health". LINUS PAULING INSTITUTE Micronutrient Information Center. Oregon State University. November 7, 2016. Retrieved March 30, 2017. ^ Holick, Michael F. (April 1, 2010). The Vitamin D Solution: A 3-Step Strategy to Cure Our Most Common Health Problems. Penguin Publishing Group. ISBN 978-1-101-22293-5. ^ Agarwal SC, Stout SD (June 28, 2011). Bone Loss and Osteoporosis: An Anthropological Perspective. Springer Science & Business Media. ISBN 978-1-4419-8891-1. Archived (PDF) from the original on January 29, 2006. The high 25(OH)D concentrations, and relatively high vitamin D requirements of apes and monkeys are understandable in light of their biology—their body surface area relative to mass is generally greater than for humans, and they are inveterate groomers, consuming by mouth the vitamin D generated from the oils secreted by skin into fur. Although much of the vitamin D produced within human skin is absorbed directly, birds and furbearing animals acquire most of their vitamin D orally, as they groom themselves (Bicknell and Prescott, 1946; Carpenter and Zhao, 1999). Vitamin D is generated from the oily secretions of skin into fur. The oral consumption of UV-exposed dermal excretion is the way many animals acquire the “nutrient,” vitamin D. Although Fraser (1983) has argued that dermal absorption of vitamin D may be more natural, what we know from animals indicates that oral consumption is equally physiological. Since vitamin D can be extracted from UV-exposed human sweat and skin secretions (Bicknell and Prescott, 1946), it is also reasonable to think that early humans obtained some of their vitamin D by mouth as well, by licking the skin. ^ Yahav S, Buffenstein R (January 1993). "Cholecalciferol supplementation alters gut function and improves digestibility in an underground inhabitant, the naked mole rat (Heterocephalus glaber), when fed on a carrot diet". The British Journal of Nutrition. 69 (1): 233–41. doi:10.1079/BJN19930025. PMID 8384476. ^ Takeuchi A, Okano T, Sayamoto M, Sawamura S, Kobayashi T, Motosugi M, Yamakawa T (February 1986). "Tissue distribution of 7-dehydrocholesterol, vitamin D3 and 25-hydroxyvitamin D3 in several species of fishes". Journal of Nutritional Science and Vitaminology. 32 (1): 13–22. doi:10.3177/jnsv.32.13. PMID 3012050. ^ a b c d Adams JS, Hewison M (February 2010). "Update in vitamin D". The Journal of Clinical Endocrinology and Metabolism. 95 (2): 471–8. doi:10.1210/jc.2009-1773. PMC 2840860. PMID 20133466. ^ a b c d Bikle, DD (March 20, 2014). "Vitamin D metabolism, mechanism of action, and clinical applications". Chemistry & Biology. 21 (3): 319–29. doi:10.1016/j.chembiol.2013.12.016. PMC 3968073. PMID 24529992. ^ Cheng JB, Levine MA, Bell NH, Mangelsdorf DJ, Russell DW (May 2004). "Genetic evidence that the human CYP2R1 enzyme is a key vitamin D 25-hydroxylase". Proceedings of the National Academy of Sciences of the United States of America. 101 (20): 7711–5. Bibcode:2004PNAS..101.7711C. doi:10.1073/pnas.0402490101. PMC 419671. PMID 15128933. ^ Laing CJ, Cooke NE (2004). "Section I: Ch. 8: Vitamin D Binding Protein". In Feldman D, Glorieux FH, Pike JW (eds.). Vitamin D. 1 (2 ed.). Academic Press. pp. 117–134. ISBN 978-0122526879. ^ "IUPAC-IUB Joint Commission on Biochemical Nomenclature (JCBN): Nomenclature of vitamin D. Recommendations 1981". European Journal of Biochemistry. 124 (2): 223–7. May 17, 1982. doi:10.1111/j.1432-1033.1982.tb06581.x. PMID 7094913. ^ Holick MF, Kleiner-Bossaller A, Schnoes HK, Kasten PM, Boyle IT, DeLuca HF (October 1973). "1,24,25-Trihydroxyvitamin D3. A metabolite of vitamin D3 effective on intestine". The Journal of Biological Chemistry. 248 (19): 6691–6. PMID 4355503. ^ Horst RL, Reinhardt TA, Ramberg CF, Koszewski NJ, Napoli JL (July 1986). "24-Hydroxylation of 1,25-dihydroxyergocalciferol. An unambiguous deactivation process". The Journal of Biological Chemistry. 261 (20): 9250–6. PMID 3013880. ^ "Age-old children's disease back in force". Thestar.com. July 25, 2007. Archived from the original on May 17, 2008. Retrieved August 24, 2010. ^ Elena Conis (July 24, 2006). "Fortified foods took out rickets". Los Angeles Times. Retrieved August 24, 2010. ^ McClean FC, Budy AM (January 28, 1964). "Vitamin A, Vitamin D, Cartilage, Bones, and Teeth". Vitamins and Hormones. 21. Academic Press. pp. 51–52. ISBN 978-0-12-709821-0. ^ Rosenheim O, King H (1932). "The Ring-system of sterols and bile acids. Part II". J. Chem. Technol. Biotechnol. 51 (47): 954–7. doi:10.1002/jctb.5000514702. ^ Askew FA, Bourdillon RB, Bruce HM, Callow RK, St. L. Philpot J, Webster TA (1932). "Crystalline Vitamin D". Proceedings of the Royal Society of London. Series B, Containing Papers of a Biological Character. 109 (764): 488–506. doi:10.1098/rspb.1932.0008. JSTOR 81571. ^ Hirsch AL (2011). "Industrial aspects of vitamin D". In Feldman DJ, Pike JW, Adams JS (eds.). Vitamin D. London; Waltham, MA: Academic Press. p. 73. ISBN 978-0-12-387035-3. ^ Ziedonis AA, Mowery DC, Nelson RR, Bhaven NS (2004). Ivory tower and industrial innovation: university-industry technology transfer before and after the Bayh-Dole Act in the United States. Stanford, Calif: Stanford Business Books. pp. 39–40. ISBN 978-0-8047-4920-6. ^ Marshall, James (September 2010). Elbridge a Stuart: Founder of Carnation Company. Kessinger Publishing. ISBN 978-1-164-49678-6. ^ Haussler MR, Norman AW (January 1969). "Chromosomal receptor for a vitamin D metabolite". Proceedings of the National Academy of Sciences of the United States of America. 62 (1): 155–62. Bibcode:1969PNAS...62..155H. doi:10.1073/pnas.62.1.155. PMC 285968. PMID 5253652. ^ Holick MF, DeLuca HF, Avioli LV (January 1972). "Isolation and identification of 25-hydroxycholecalciferol from human plasma". Archives of Internal Medicine. 129 (1): 56–61. doi:10.1001/archinte.1972.00320010060005. PMID 4332591. ^ Dankers W, Colin EM, van Hamburg JP, Lubberts E (2016). "Vitamin D in Autoimmunity: Molecular Mechanisms and Therapeutic Potential". Front Immunol. 7: 697. doi:10.3389/fimmu.2016.00697. PMC 5247472. PMID 28163705. ^ a b Heaney RP, Holick MF (March 2011). "Why the IOM recommendations for vitamin D are deficient". Journal of Bone and Mineral Research. 26 (3): 455–7. doi:10.1002/jbmr.328. PMID 21337617. ^ Holick MF, Binkley NC, Bischoff-Ferrari HA, Gordon CM, Hanley DA, Heaney RP, Murad MH, Weaver CM (July 2011). "Evaluation, treatment, and prevention of vitamin D deficiency: an Endocrine Society clinical practice guideline". The Journal of Clinical Endocrinology and Metabolism. 96 (7): 1911–30. doi:10.1210/jc.2011-0385. PMID 21646368. ^ "ODS Vitamin D Initiative". Bethesda, MD: Office of Dietary Supplements, US National Institutes of Health. 2014. ^ Pyrżak B, Witkowska-Sędek E, Krajewska M, Demkow U, Kucharska AM (2015). "Metabolic and immunological consequences of vitamin D deficiency in obese children". Body Metabolism and Exercise. Advances in Experimental Medicine and Biology. 840. pp. 13–9. doi:10.1007/5584_2014_81. ISBN 978-3-319-10249-8. PMID 25315624. ^ "How is vitamin D being studied now in clinical cancer research?". Bethesda, MD: National Cancer Institute, US National Institutes of Health. October 21, 2013. ^ Cashman KD, Dowling KG, Škrabáková Z, Gonzalez-Gross M, Valtueña J, De Henauw S, et al. (April 2016). "Vitamin D deficiency in Europe: pandemic?". The American Journal of Clinical Nutrition. 103 (4): 1033–44. doi:10.3945/ajcn.115.120873. PMC 5527850. PMID 26864360. ^ Sarkar FH, Li Y, Wang Z, Kong D (September 2010). "The role of nutraceuticals in the regulation of Wnt and Hedgehog signaling in cancer". Cancer Metastasis Reviews. 29 (3): 383–94. doi:10.1007/s10555-010-9233-4. PMC 2974632. PMID 20711635.